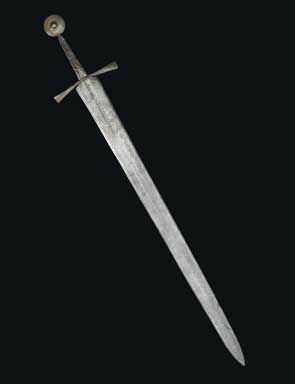 A Crusader Sword, probably 14th century, Italian or German with added Mamluk inscriptions. Estimate: £150,000 - £200,000. Photo: Christie's Images Ltd., 2010. 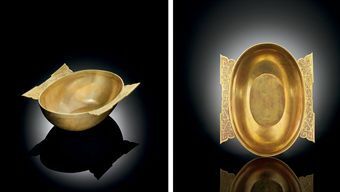 LONDON.- A broad variety of works of art, paintings, manuscripts and an intricate and jewel-like panelled room will be offered at Christie’s sale of Islamic and Indian Art on 13 April 2010. The painted and gilt carved room (estimate: £200,000-300,000) recreates the splendour and beauty of Damascus in the late 18th/early 19th century. The fashion for richly decorated interiors gained popularity in the capital of Ottoman Syria during this period of the late 18th and 19th centuries. Hidden behind plain walls, the palaces of important families were places where the rococo fantasies of their owners came to life. The intricate giltwood mouldings, inset mirrors, carved niches, finely painted landscapes and bouquets of flowers, all contained in this superb interior, reflect the multicultural influences and wealth of the Old City, Damascus. The tradition of these rooms being assembled outside the City stem from their original use in the residences of the Western consuls to Damascus. During the Inter-War period, connoisseurs began to acquire these rooms and assemble them in their houses outside Syria to create Ottoman interiors. There are some notable examples that remain intact, including in the Metropolitan Museum of Art. The variety and virtuosity of this interior speaks of the accomplishment of the artisans of Damascus. With its suspended chandelier, the ceiling is also a particular tour de force; a magnificent example of the period which was never equalled later in the century. Christie’s recently sold another example of a painted and carved Damascus room, dated 1799-1800, for £361,250 in October 2009. A superb portrait (estimate: £500,000-800,000), circa 1880, by Isma’il Jalayir is one of the most important paintings by the artist ever to appear at auction. Works by this enigmatic artist are particularly rare, due partly to his habit of destroying paintings that were not up to his own high standards. Isma'il Jalayir (d. ca. 1868-73) was the son Hajj Muhammad Zaman Khan Jalayir of Khorassan, who was a follower of a Sufi Sheikh of the Dhahabiyai order called Muhammad Isma'il Dhabihullah, for whom Jalayir was named. After he graduated from the Dar al-Fununi, of which he has been dubbed 'the most gifted alumnus', he became an instructor there and his highly individualistic style found favour with Nasir al-Din Shah, of whom at least two portraits by Jalayir are known. Whilst many of the facts of Jalayir's life remain unsubstantiated, it has been suggested both that he was a user of opium and that he went mad. The spiritual quality of his work may further have been fuelled by his attachment to mysticism. It is also possible that the melancholic quality in part alludes to the transitory nature of life in the rapidly changing society of Iran the late nineteenth century. A magnificent and historic Crusader sword dating from the mid-14th century has survived in superb condition, partly because it was given to the armoury in Alexandria (estimate: £150,000-200,000). Inscribed with the name of the amir, it was donated by the Amir Aristay II, who was the governor of Alexandria between December 1400 and May 1401 and who died in 1408. At that time it was perfectly normal for swords to be given in a religious context. Originally made in Europe, probably in either Italy or Germany, the sword was decorated with the lion and a Cross. It was then inscribed by Mamluk captors in Arabic with the name of the Amir as part of a pious donation. One of the reasons for its superb condition is that it is one of only very few examples not excavated. It is tempting to link the presence of this number of crusader swords in Alexandria to the sacking of the city that took place in the final crusader assault, the short-lived attack by King Peter I, the Lusignan ruler of "Cyprus and Jerusalem" in 1365. Further highlights include a fascinating 15th Century Manuscript on Astrology which was originally from the Library of Sultan Bayezid II, the grandfather of Suleiman the Magnificent and father of Selim I (estimate: £8,000-12,000). The manuscript is actually inscribed on some pages stating that it had been appreciated by the reader, the Sultan. A vibrant Iznik pottery tile panel with dense vine leaves dating from the Ottoman period, circa 1575 (estimate: £60,000-80,000) is a further exquisite highlight. 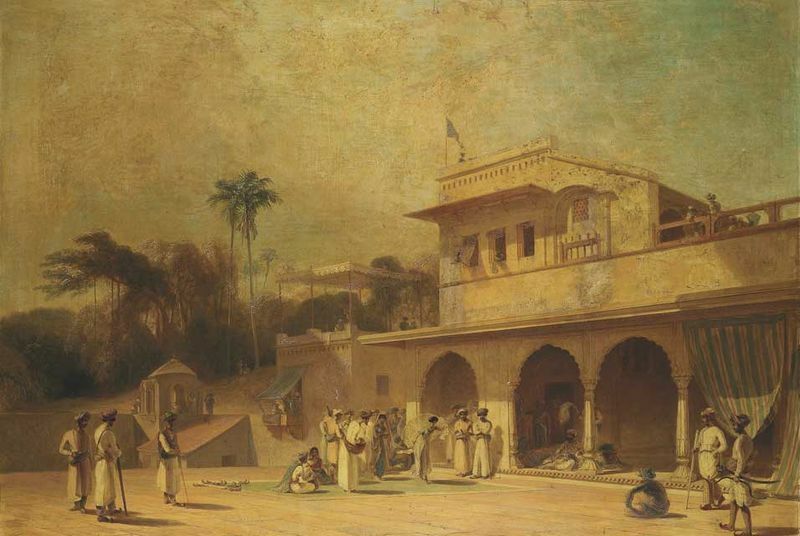 Leading the Anglo-Indian works of art is a newly rediscovered oil painting by Thomas Daniell thought to have been part of the artist’s own collection that has been unseen in public for 150 years (estimate: £100,000-150,000). The work is recorded, along with two other oil paintings by Daniell, as having been sold by a Mrs. Daniell for 5 gns. at Christie's on 30 June 1853. It depicts a palace in Juanpore, India. The picture was in the collection of Sir William H. Gregory (1817-1892), a former Governor of Ceylon, and Lady Gregory, a renowned figure of Irish literature, whose home was Coole Park, County Galway. The house hosted guests such as Bernard Shaw and Masefield and W. B. Yeats, who made it his home for many years. In 1932, the house was sold and demolished, and its contents dispersed in a local auction. The Christie’s South Kensington sale of Indian and Islamic Works of Art and Textiles to be held on 15-16 April 2010 is one of the largest ever to take place at the saleroom, and will offer approximately 700 inspiring lots with estimates ranging from £300 to £50,000, including stunning and important pieces from several private collections. A selection of around seventy-five lots from The Collection of the Late Djafar Ghazi comprises a wonderful group of Ottoman, Safavid and Qajar manuscripts, as well as miniatures and calligraphy. One fine example is an Ottoman Qur'an signed Ramadan bin Isma'il min Talamith 'Abdullah Hamidallah, from Turkey, dated 1078AH/1667AD (estimate: £4,000-6,000). A collection of eighty Indian miniatures from the Property of a Gentleman features delicately composed 18th and 19th century paintings. Property from an Italian Collection features ten magnificent examples of Gandharan sculpture. Also offered in the sale are a variety of Ottoman, Safavid and Qajar works of art, a superb collection of medieval Islamic pottery from the 9th -15th century and Indian and Deccani bronzes. Highlights from the textiles section of the sale include a rare white ground, embroidered widow's robe from Turkmenistan, called a Chyrpe (estimate: £8,000-10,000), and a Safavid silk fragment of an elegant courtier, 16th century, from a Private Institutional Collection (estimate: £8,000-10,000). The Crusader Sword shown above looks magnificent! It's a kind of sword that seems to tell a lot of story, from it's European features to it's Islamic inscriptions. Amazing.